Growth is happening every single day in the Historic West End. From the buildings going up, to the need for parking for the people working in these new and existing structures. 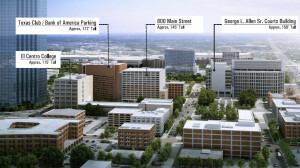 According to the Dallas Morning News’ Robert Wilonsky the West Ends own architects extraordinaire Corgan Associates will indeed be building a 1,500-car parking garage, just on the edge of the West End district on a block surrounded by Market, Elm, Lamar and Commerce Streets and would be adjacent to the existing Texas Club Parking Garage. There are some mixed feeling concerning the parking garage, including its height – which is over the districts height limit of 100 feet for new construction. Many are also excited, saying on the bright side it could help solve a huge challenge in the district and western downtown corridor. Many of the residents and restaurants would like to see it benefit the district and continue with the new spirit of excitement that seems to resonate from the entire West End. Many people ask me daily “Where can we park” or “Where is the closest parking”? It can be challenging and sometimes even I cannot find a spot. It makes me happy for the districts growth and vitality, but it worries me that folks might not know where to find the spaces. Every day we host everything from school children visiting our museums to people looking for a great patio to spend their lunch hour or dinner. There are also a huge amount of businesses, incubators and start ups with clients & employees that are in and out of the district daily, and at various different hours. When you pair all of these with the people living in the West End, the opportunity is there to do a little give and take. We hope this means that there will be more spaces, and increased excitement about the continued growth and revitalization of the entire downtown corridor. If you want to know more about the Historic Dallas West End District, or simply need advice in where to park, email Info@dallaswestend.org. Photo Courtesy: Corgan Associates, Dallas Morning News.